We arrived in Mombasa to a media frenzy and vibrant welcome in time for the official programme to begin. The positivity and engagement around this project was palpable. 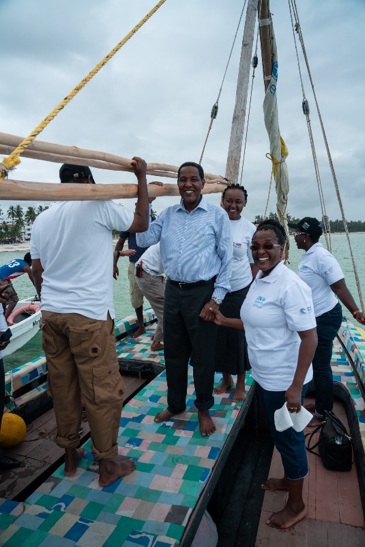 The Mombasa event really represented a turning point in the history of The Flipflopi project – we were joined by so many key stakeholders who hold the keys to implement real change in the plastic revolution. Alongside UNEP, we were joined by national and county government key policy makers for the environment, the private sector, conservationists and plastic and environment bodies like PETCO and NEMA. This was a momentous occasion – building an alliance to make real commitments for real change in Kenya and beyond. Here we heard real pledges for continual support for the Flipflopi long term goals and commitment to activate real change at policy level. We look forward to making these pledges a reality. Here are some of the key statements from the Mombasa event, to name just a few. We are really proud of the engagement and traction this project is attracting – this has always been our aim: to create public discussion and bring policy makers, and the private sector together to take ownership of this issue. We are so excited by the news that the Mombasa event resulted in direct impact on the tourism industry with the announcement that 17 hotels on the coast have now banned the use of plastic bottles and straws including the large hotel resorts Tamarind and Serena Inn Group. The UNEP Clean Seas initiative strapline is to ‘turn the tide on plastic’ and that is what we believe we have contributed to in Mombasa. We have a lot to be grateful for - with associations like PETCO, the industry is starting to take responsibility for their plastic waste – we hope and dream that now more stakeholders come together at all levels of government and business to catalyse what we believe could become Kenya’s m-taka revolution.